Assassin’s Creed is one of the most beloved franchises of the gaming industry, still many have their doubts about the game and whether it needs to have as many iterations as it has now. We can only remind you that the sales speak for themselves. In the latest release, the game takes us to the ancient Greek civilization, where no myth will be left untouched. Are you into the stories of Pandora or even the Peloponnesian war, this game has it all. This captivating game made our eyes locked onto our television screen for hours on end and still, there is so much left to explore. The game’s storyline is set in 431 BC, where we can find the Peloponnesian war raging on. 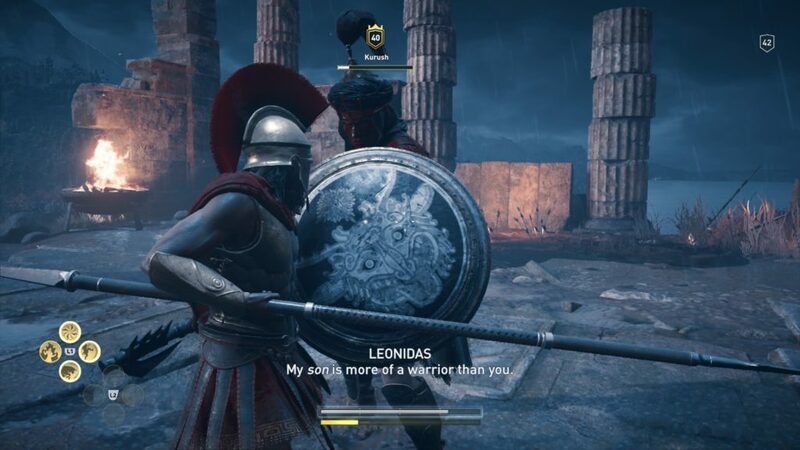 In the game, you start off as the legendary hero Leonidas, who is leading the Army of Sparta. Ready to fight the Persians and win the war, but due to unfortunate events, Leonidas gets betrayed and enclosed by the enemy led by Xerxes. After this cutscene, we change back to the modern world where we are playing as Layla Hassan, who was first introduced in Assassin’s Creed Origins. 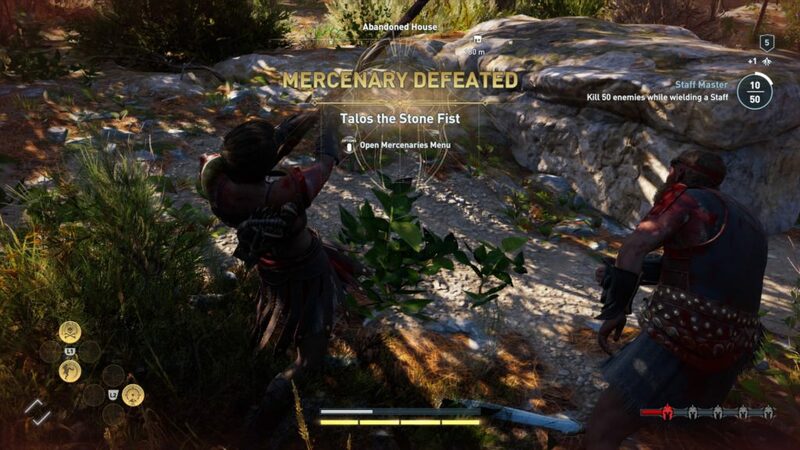 When Layla uses the Animus device to get back to 431 BC, you can choose between the storyline of the mercenary Alexios or Kassandra who are siblings but separated due to a tragic event which will cost them greatly and test the roots of their loyalty to one another. When the storyline advances it will be your decision if you want to pick the side of Sparta or Athens. Will you betray your Spartan roots or stay true to your past, it’s all up to you. The storyline will advance throughout the whole game and progress by playing the main quest line. This means it’s up to you if you want to proceed further into the storyline and leave out the side quests or lengthen your playtime by also playing the side missions. No doubt that this game is one of the better-looking games of the year. When we look at the environments they have in store for us in Assassin’s Creed Odyssey, we can only say that they keep on improving slightly with each new iteration that they send out into the world. They throw us literally in the world of the ancient Greeks, where they found a balance between areas that feel empty and lively. This is in our opinion something that a lot of games lack, it is hard to find a happy medium in RPGs these days, especially when you reproduce a world that could’ve existed a few millennia ago. When you walk around, ride a horse or even sail your way through the landscapes everything catches your eye, from underground ruins to Greek temples. If that doesn’t satiate your hunger you can also explore caves drenched with water or inhabited by bandits who rob inhabitants of the little they have. It is hard to find flaws, so we searched hard and found some, but they are honestly not even worth mentioning. Still curious? Well, when you pause the game at certain points where weapons stick through rivals, you can see that the weapon doesn’t pierce the target as well as it should be. Sound wise this game doesn’t stray far from its predecessor Assassin’s Creed Origins in terms of theme-related music. 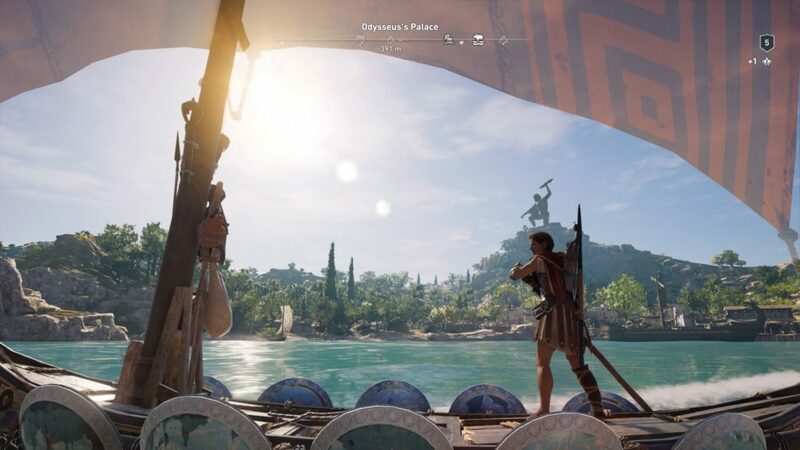 While Origins largely focuses on music that fits an ancient Egyptian society, Odyssey does the same with this game’s environment, namely ancient Greece. When you want to notice it, you really need to focus on the music, because when the music fits the game perfectly, it just feels natural to hear. Besides the music we also have a perfectly voice acted game. 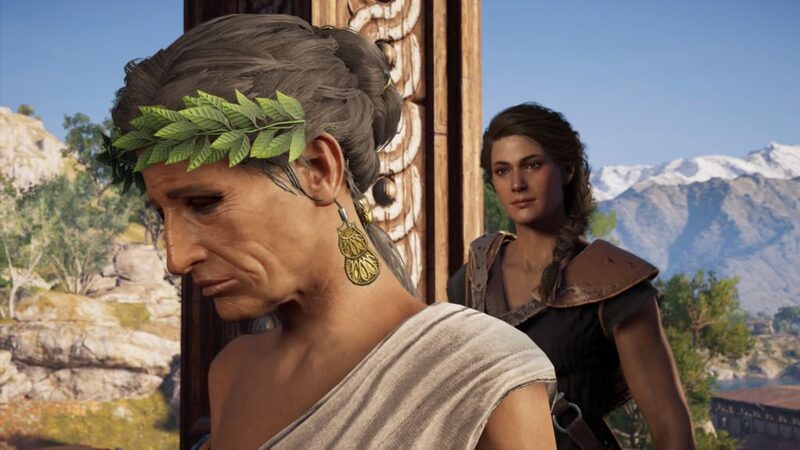 For example, the girl Kassandra is somewhat tough because of her rough past, and this radiates through her voice. They seem to succeed in finding the perfect voices fitted for each character. Each character you’ll encounter will give you a different vibe, just by the tone of their voice and the way they speak. 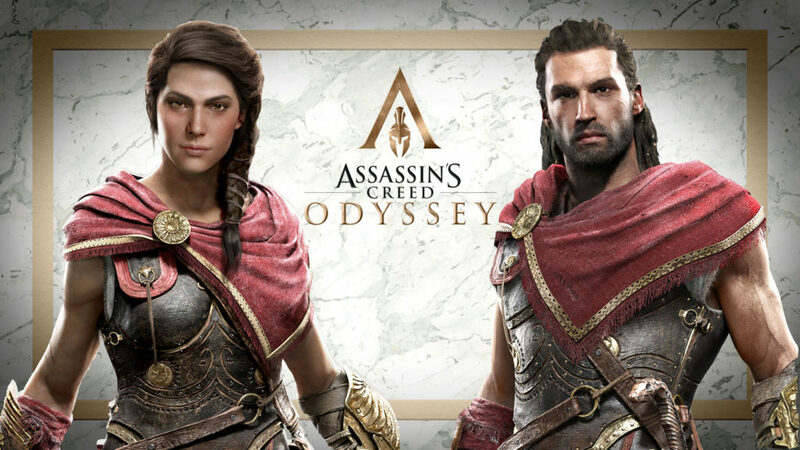 Assassin’s Creed Odyssey is an action, adventure role-playing game where you walk into the shoes of the Spartan outcasts Kassandra or Alexios. The game revolves around their storyline where you are able to choose between a lot of different options to mould the game into your own liking. Do you want to be a Spartan or fight for the Athens, it is all up to you. This game is the first that is actually meant to be played as an RPG where you need to roam around the world to find your quests and objectives. If this is not the way you want to play the game, you can also use the original Assassin’s Creed adventure mode. The world is full of places to discover and conquer. Like the other Assassin’s Creed games there are a lot of side stories to fulfil, where you can complete an area on the map. This can be anything from a bandit camp overtaking to a full discovery of an area. The side quests vary a lot and can range from helping farmers escape from their petty lives or even killing some bounty hunters who think you are an easy money making target. The combat is quite the same as in its predecessors, you have your basic light attacks, heavy attack, ranged attacks and blocks. Also, you can invest into special abilities which give you more powerful combat actions against your opponents which brings them down a lot quicker. In terms of gear, you can fully customize your character with loads of armour and weapons. You can place ‘buffs’ on each one of them, but in the end, if you want gear with much better stats you need to receive it through quests or as loot. So grinding for better gear is a must in this game. 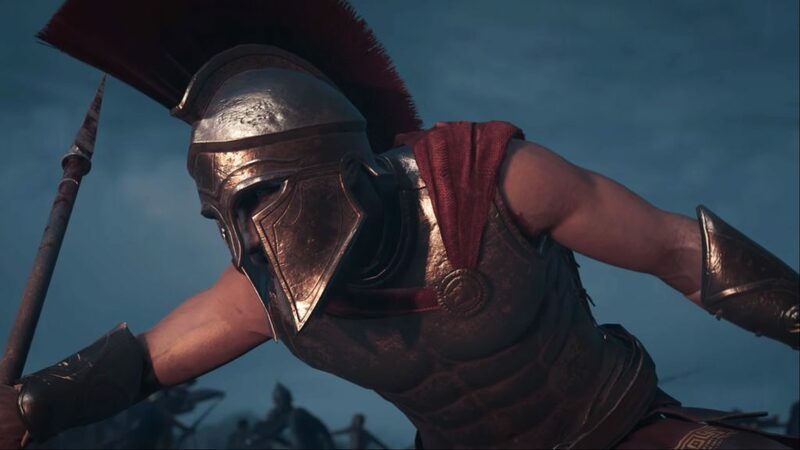 Assassin’s Creed Odyssey does not disappoint and brings a new addition to the franchises with more background on how and why the Creed started. While this game is by no means dictated by the Assassin’s Creed, we see the reason behind the buildup. The world nor the relics are safe in this world and the elite needs to get some resistance. All this while giving you an amazing game with beautiful graphics and a whole world to explore and even better, living the life of a Spartan with his or her own take on the world.